The LG mobile division was able to ship some 10.3 million smartphones in Q1 of this year, resulting in a sales growth of some 30% compared to Q1 of 2012. This is especially impressive considering that this includes an almost a 15% sales increase over the previous holiday quarter. Phone unit profitability more than doubled in this time period as well, which was reflected by an increase in operating margin from 2% to 4.1%, and profits rose from $50 million to $119 million, thanks to sales of the Optimus G and the L-series handsets. 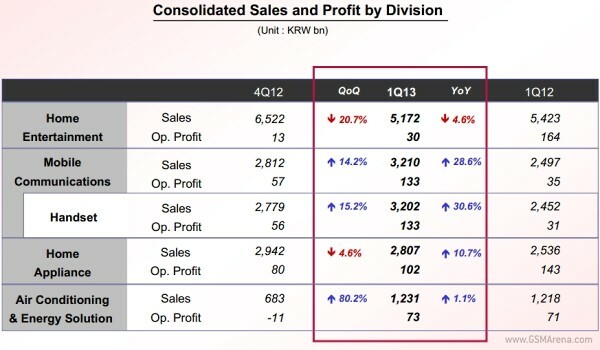 The Koreans are also optimistic in regards to growth for Q2, with the Optimus G Pro tablet and L-series II handsets poised to boost the sales further. Although it's still some way off backyard rival Samsung, LG's sound launch strategy is part of what helped it get back on the map: just when interest in the latest Samsung product starts to wane, it comes out with a more robust competitor. This was the case with the Optimus G and the Galaxy S III, and the Optimus G Pro, which tackled the Note II. Now, the expected LG Optimus G2 is expected to give the Galaxy S4 a run for its money come Christmas time, but we'll have to see what, if anything, Samsung has in store for that period.